During the Legend's action figure run, you had combos that made sense, like Starscream & Waspinator. Other's like Shrapnel & Reflector just don't make much sense at all. In this case of this team up, well it's a bottom feeder. I mean Megatron is one of the big bots. You just don't fear Megatron! You fear the hint of his very fumes. While Chop Shop, well he's as well known as the Omnibots. However, I digress, under fear of death, I will permit them to introduce themselves. Hello Earth Germs, what makes you think you have the right to know me even in passing? I am Megatron, the one true leader of the Decepticons! Where I command they will go! Even that backstabbing traitor Starscream follows my orders under fear of death or exile! Even if I was an idiot resurrecting him (see Transformers Generation 2, Marvel comic #10 for complete quote) since his treachery is legendary. Due to unforeseen circumstances I have foresworn my gun alternative mode. I now plan to lead my forces all over the galaxy in the guise of a tank! I will have the luxury of crushing the unarmed Optimus Prime under my very treads! Decepticons forever! Uh hi, name is Chopshop, if it's not bolted, nailed, and chained down I will steal it. I think there was a mistake in this team up, since Swindle and I had a good racket going on back on Cybteron back in the day. I'd steal it, he'd sell it, and we both made a tidy sum. With Megatron I feel a bit off, I mean he's the big cheese, and I am a nobody. You humans might've known me from um nowhere really. I am one of those background bots that Megatron is in his infinite wisdom has fighting in places you humans really don't see. Off the back cover it says, and I quote here. Chop Shop has served the Decepticons for years, but not without some difficulty. Megatron does not take kindly, after all, to the way things seem to disappear around the insecticon warrior. Chop Shop is a born thief, with a compulsion to steal things that outweighs even his fear of the consequences should Megatron ever catch him. Megatron blasts he way out of the box in robot mode. Now there is at least one nod to his Generation 1 format. He has a huge cannon on his right arm, guess that means he's right handed. The cannon does have one flaw it's too long on the base end of it. Either Megatron can bend his arm, and fire with the cannon hanging off the side of it, or he fully extends his arm to fire. I can easily see arguments being made for both ways of how Megatron is suppose to fire his cannon off. For the record here sadly the cannon is not really detachable, despite Megatron having 3 other points on his two arms to fire it with, it's attached to his arm via ball joint, great for moving and swivelling, but not great for removing. Yes I did mention Megatron had three other points of attachments, typical 5MM ports, one in each hand, and one on his left forearm. They can easily accommodate any weapon with a plug of 5mm. 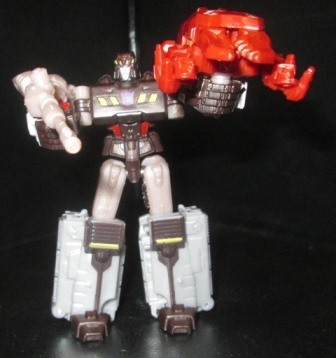 In something of a feat of strength, Megatron can carry Generations Jetifre gun fully loaded. Think about it for a sec, this means Megatron can a gun that is larger than him in any way. Someone break out a 10 for old Meg's for a moment. On a closing not the way Chop Shop operates as Megatron's weapon is like cybertrontic brass knuckles, he plugs into either a hand of the 5 MM port on the left arm. Open him up, and smash! Alright we've spoken about his arms, but what about the rest of Megatron? Well he's got great articulation given how his hips, and his shoulder joints are both ball joints. His knees are strong enough to let him sit in mid air unaided. You try doing that and seeing how easy it is, it's not, trust me. His head turns the full 360 degrees, not up or down, but hey nobody is perfect. Megatron does have two big flaws. The clips that attach his shoulders to his body to keep it straight are weak, and he supports hollow bot syndrome. You turn him around and it's almost all empty space, or area where Hasbro couldn't spend a few cents to finish him to make him look great. As stated earlier Megatron turns into a tank, so let's go to work, shall we? Flip his feet down, away from his body. You'll find the outside of the legs then are easily flipped past them, so you should now have the feet between two sides of the legs. Remember that con I just mentioned for the arms? Well time to deatach them. As kids we sometimes put our legs over our heads, well Megatron does that to transform. You'll have sets of teeth on each side to mesh together, and unlike other sets I've work with over the years they work very smoothly I find. 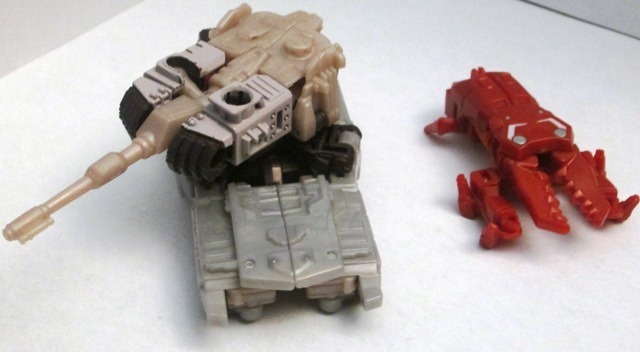 Now Megatron has the body of a tank, but he lacks a turret! Whoops, don't worry folks, just getting there. Your gut will tell you to get both hands lined up to close him up, and you're dead on the money, with both hands facing down, you can plug the plug on the cannon in his left hand, and leave a 5mm port above it exposed. Let's tear him down after we transformed him shall we? Megatron is for better or worse a generic tank, guess it makes sense given how he's a robot in disguise. I mean specific tank might make those pesky humans think the tank belongs to their side, and not another nation. He rolls well along several surfaces, the wheels never catch. The tank turret can rotation 360 degrees, give how it's formed, he can fire anywhere above him. Hey Megs stop for a second, I think some arms dealers want to talk to you about that feature. Megatron has only a few minor flaws as a tank, his front end is wide open without Chop Shop there, and the fact that his turret sight is off. Before I wrap this part of the review up, I do want to mention great pro. Now as we all know scaling with toys isn't one of the best things Hasbro does. We've all see Transformers of the same class size, and they look way off. Well good news everybody, Megatron and Optimus Prime are almost precisely the same size. I hate to be the negative reviewer, but despite being in his beast mode, Chop Shop is in his robot mode as well when he comes out of the box. I mean literally flip him around, extend his arms, and he's ready for action. Now Chop Shop shares some problems with other insect Transformers who hang out with bigger bots. He has small insect legs that can be easily broken off. His 5mm plug sticks out like a sore thumb, his hands can't hold anything. What's good about him? Well top marks to detailing, and paint, I can assure you. Hasbro went the extra mile to try and make him seem larger than he is by giving him groves, and textures, and paint where in the old days they'd just ignore it. Chop Shop put your hands in the air like you really don't care, now do the splits, not 60, not 70, not 90, but 180 degrees! I can hear every man out there going OUCH at the thought of that. In some ways he's in perfect shape now, the spines of his beetle teeth are exposes to slice into any nearby Autobot, and in this case hollow bot syndrome servers a purpose, with minimal effort you can line some of those holes up with the pegs in the front of Megatron's tank mode to merge them together as one united Transformer with the goal of advancing the Decepticon agenda! I always feel bad as a reviewer when I have so little to say about a Transformer, but there isn't much to say about Chop Shop since he doesn't move much, he can't do much, sadly he isn't much to write home about. Transformation Design 9/10 I can see the design team's problem working with such small toys, since their gut says flip the legs in, close the arms tight and take five. However, giving Megatron such a beautiful tank mode, and the fact that it works well with Chop Shop in his alternative mode. Top marks! Durability 8/10 Both Megatron and Chop Shop were subjected to toy torture here, maybe not a dog who thinks they're a chew toy, but dropped, and bounced, and heck they survived in my suitcase on an international flight (while in the package). They held up though it all, despite Chop Shop's insect legs being small and screaming chew me, they are made of hard plastic, which gives him nice high marks. Fun 9/10 I wish I could give two fun ratings, since Chop Shop, I am sorry, you were voted off the Island. He's not fun for several reasons. However that 9 on 10 was earned by Megatron! This is the Decepticon leader, this is the toy every kid who has Optimus Prime wants because Megatron is his counterpart. 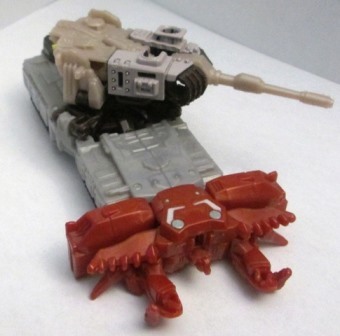 He's a small little tank that will fit in a child's pocket so they can terrorize their siblings with, or to up it a notch, so a collector can have him and Prime go for a king of the road contests. Aesthetics 10/10 With marks this high someone is on fire! In this rare instance it's not a divided score with the Legends series. I am not a fan of exposed screws and pins. 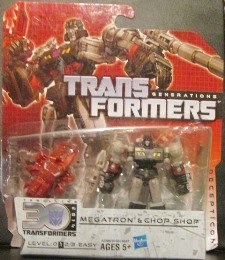 Hasbro worked them into the overall design of Chop Shop. Megatron's only flaw is his hollow bot syndrome in robot mode. On a minor note he's one of the few Legend class sized toys to have this flaw. Articulation 9/10 Megatron is a masterpiece in a lot of ways for articulation, with the ball joints in his arms, and hips. The fact he has a fully mobile turret. Just excellent, top marks! If only old Chop Shop was better than a plastic bit that can do jumping jacks. 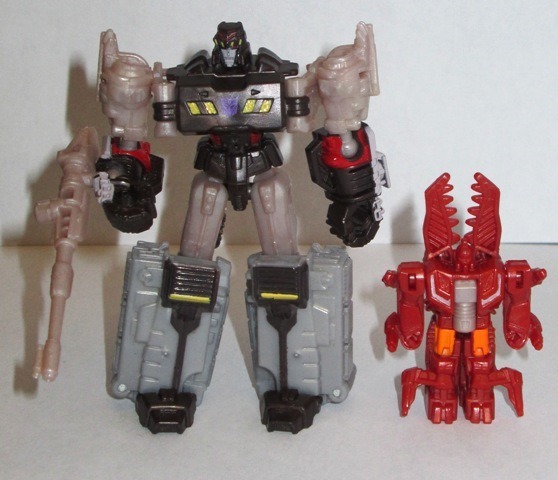 Value7/10 Two bots for $10, one great, one not so, great deal as far as I am concern. Overall 8.6/10 8.6, not bad if I do say so myself. Megaton's design is beautiful, a credit to the design team, and like Optimus should be brought to a larger toy size because I'd love to see them play with it. Chop Shop, well he's an unknown bot, and with nothing being great about him, except hiding the screws that made him. In the end you should buy this pair for Megatron, and not for Chop Shop, since he's so bad he should've been left on the shop floor.